Signal crimes change how we think, feel, and act — altering perceptions of the distribution of risks and threats in the world. Sometimes, as with the recent assassinations and mass shootings in France, sending a message is the intention of the criminal act. The attackers’ target selection of the staff of Charlie Hebdo magazine, and that of taking and killing Jewish hostages, was deliberately designed to send messages to individuals and institutions. Researchers examine social reactions to different kinds of crime events and the signals they send to a range of audiences. The aim is to determine how and why certain kinds of incidents and situations generate fear and anxiety responses that travel widely and, by extension, how processes of social reaction to such events are managed and influenced by the authorities. The murder of Lee Rigby in London in 2013 can be understood as a signal crime as it triggered concern amongst the general public and across security institutions, owing to the macabre innovation of the killers in undertaking a brutally simple form of assault. Analysis of the crime has identified a number of key components to the overarching process of social reaction. Observing how events have unfolded in France, the collective reactions have followed a similar trajectory to what happened in London. In the wake of both incidents there was ‘spontaneous community mobilisation’ as ordinary people sought to engage in collective sense-making of what had actually happened, coupled with collective action ‘to do something’ to evidence their opposition. Widespread use of social media platforms helped spread rumours as attempts were made to follow updates in the story; rapid moves were made to secondary conflicts as acts of criminal retaliation were committed against symbolic Muslim targets. What we can detect here is how fear of not being able to protect against potential attacks is being mobilised to justify new preventative anti-terror legislation. In effect, public and political fear is being deployed to shape the reaction to terrorism, where reaching for new legislation has become part of the societal response to terrorist attacks. However, it increasingly appears that this approach is inadequate and that we are dealing with a social problem that we cannot solve by legal means alone. Indeed, a more nuanced and sophisticated approach to counter-terrorism policy development would probably look elsewhere for solutions. After all, in both the French cases and that of Drummer Rigby, it transpired that the perpetrators were well known to the authorities as presenting a risk. Rather than creating legislative fixes to collect more intelligence, research suggests the focus must be on finding effective policy solutions to three inter-linked ‘wicked problems’ that have been identified in issues of radicalization and home-grown extremism. The first of these, mentioned earlier, concerns the ability of the politics of counter-terrorism to resist the allure of introducing new security measures that might corrode levels of integration and cohesion. Over the long-term, over-reaction to terrorist provocations can be as harmful as the initial act itself. This connects to the second ‘wicked problem’: tension between the tactical and strategic response to countering violent extremists. The police and security services focus upon stopping violent acts, often engaging with individuals whose ideas are not coherent with liberal democratic traditions. Preventing or stopping these acts does not reduce the longer term influence of these radical ideas. Thirdly, all plausible theories of radicalisation into violent extremism identify a pivotal role played by ‘non-violent extremists’: those who do not engage in violence directly, but whose ideas and rhetoric influence others to do so. These create a ‘mood music’ of ideas, values, and beliefs that presents violence as a permissible means to an end. In the wake of the killings in France, there has been a widespread call across Europe to protect the right to freedom of speech. However, this freedom will also be used by those motivated to undertake mass killings. Current counter-terrorism policy struggles with what to do with individuals who steer and propagate the radicalisation of others by engaging in activity that is troublesome and unpleasant, but not necessarily illegal. One of the principal institutional effects of high profile signal crimes is to implant a political imperative to consider what can be done to predict, pre-empt, and prevent similar atrocities in the future. However, it is increasingly clear that it is not going to be possible to prevent all such attacks. Developing a conceptually robust evidenced understanding of how and why our collective processes of reaction occur in the ways they do, and the institutional effects that such assaults induce, seems vitally important if we are to collectively manage our reactions better when the next attack comes. Headline image credit: Paris rally in support of the victims of the 2015 Charlie Hebdo shooting, 11 January 2015. Photo by “sébastien amiet;l”. CC BY 2.0 via Flickr. Professor Martin Innes is Director of the Universities’ Police Science Institute at Cardiff University. 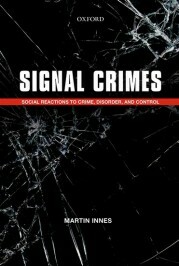 His book Signal Crimes: Social Reactions to Crime, Disorder and Control was published last year by Oxford University Press.